Why do most people buy life insurance? 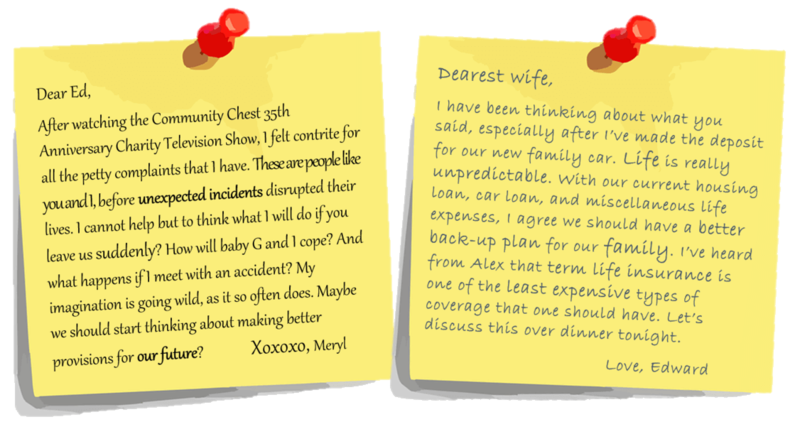 In case you are like Meryl and Ed, read on to understand better why most people buy life insurance. At different stages of life, we assume different roles and responsibilities. Our increased life commitments also signify potential liabilities, subjected to the great unknown. If given a choice, most people would rather give joy than misery to our loved ones. Wouldn’t you? Having life insurance gives one the assurance and peace of mind that their loved ones will not be subjected to financial difficulties in the event of an unexpected incident. While there’s limited capacity for what one can do to minimise potential emotional and mental pain of a losing a loved one, at least a life protection plan can help to ease unexpected expenses and financial obligations. If you were to die tomorrow, who would assume your debt? Are you financially secured or have assets to take care of your dependents’ immediate financial needs? After your demise, how long will it be before your property is turned over to your inheritors? Will your property owe substantial debts and taxes after your death? If you are a business owner, does your business has a succession plan? How many people depend on your earning capacity? Do you have children that are depending on you? How much money would your dependents need for living expenses? How long would it take for your dependents to become self-sufficient? For your information, there are term insurance and whole life insurance. Term insurance are life protection plans that are fixed for a certain period whereas whole life insurance will cover the span of a lifetime. Which is a suitable policy for you? Generally, the premium for whole life insurance will be higher but there is usually a savings component to it. In the event whereby you change your mind and wish to surrender the policy, there would be a payout. However, do note that the surrender value would be lower than the death benefit payout. For term life insurance, the flexibility of the coverage period, which allows premium to be lower, is also a limitation from another perspective. For example, if you purchased a term insurance policy for 20 years at the age of 25, you may find a significant increase of your premium at the next renewal. You’d also need to be in the pink of health, otherwise you may be disqualified from buying an insurance policy. The difference in premiums (amount you pay) will vary for each person, depending on age and health. 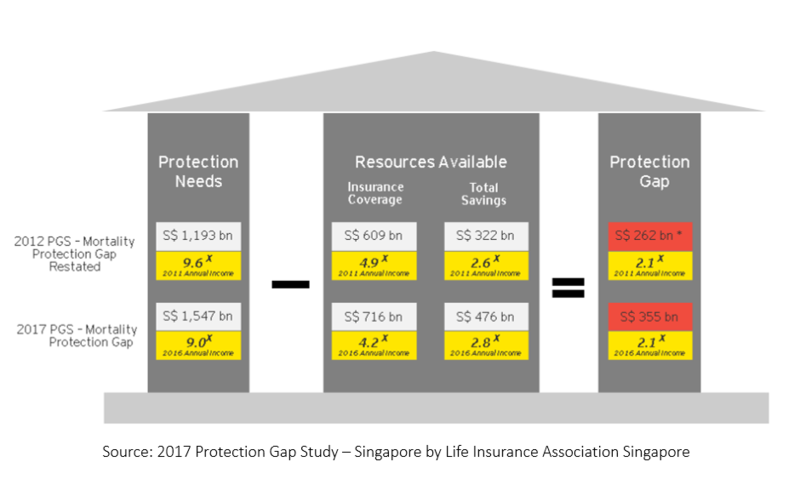 As of 31st December 2016, the ^Mortality Protection Needs of Economically Active Singaporeans and Permanent Residents is S$1,547 billion, which translated to an overall protection need of 9.0x average income. After allowing for insurance and savings, the mortality Protection Gap of working adults is 2.1x annual income. While it is never too late to make provisions for the future, especially when it involves our loved ones, it is better to do so sooner than later. The above figures highlight the importance of having both adequate savings and insurance coverage in case of rainy days. Still wondering about life insurance? Find out more here or contact Etiqa Customer Care at +65 6887 8777.